At Weekend at the Asylum there was a session called “Taming Metal” that was run by a panel consisting of “Herr Doktor“, Trevor Frank and “Dr Quack.” They started with the easiest way to join two metal pieces together and moved to the more involved techniques as the session went on, and they also touched on some important tools and safety tips, and etching advice. The following bullets are based on my notes that I took during the session. Epoxy often looks like two syringes that are connected. But let’s start with the easier stuff. Epoxy is more effective than other types of glue for adhering metal to other metal, or metal to other materials. And what is epoxy, you ask? It is usually a combination of two resins that are only mixed at the time you are using them and any extra must be disguarded, unlike glue that can sit on your shelf forever and more or less stays the same (though of course, glues to dry out over time). Any time you are going to use an adhesive rather an a screw, solder or welded connection make sure that you rough up your surface. The little scratches left behind by sand paper or steel wool will give your glue more to grip and create a better seal. And to give your glue its best shot, try to find a way to clamp or weigh down the connection point for at least a day or two while the adhesive sets. To preserve the look and texture of the metal while clamping, it is a good idea to put a cloth between your material and the shoes (or holdy-onny part of your clamp) or use a clamp with rubber covering the shoes. A few shapes that nuts can take. 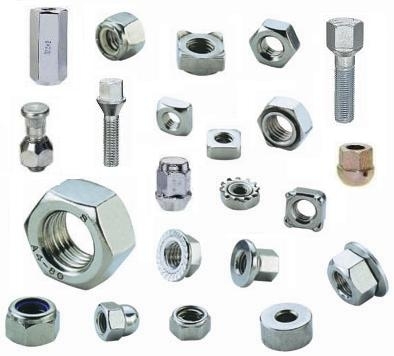 Nuts and bolts are a great way to hold metal together, but you will probably need to drill holes before you start. Dremels and other small, handheld drills can get through most thing sheets of metal, but watch out for shavings that can be sharp. But, it can be hard to find nuts and bolts that are the right color or type of metal (most are shiny, stainless steel like those at the right) to go with steampunk designs, so you may want to pre-rough them up if you are planning to add paint or use rivets instead. Rivets are cool and very steampunk. 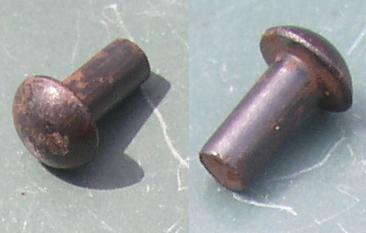 Unlike screws and nuts n bolts, rivets are more or less meant to be permanent fasteners. The look a bit like a screw, but the shaft is smooth. The shaft is put through a pre-drilled (or pre-existing) hole and the tail end get smooshed to create a little barbell that holds your materials in place. If you like the look of rivets but don’t want to take the time or find the right tools for the job, I will give you some advice about how to fake rivets for cheap in my “Creating with Quicksilver” post next week. I think I may have just snapped up the last affordable room in all of Lincoln last night as I made my arrangements for Europe’s largest Steampunk Convivial, Weekend at the Asylum. If you were thinking about going but you are still on the fence, make sure to get your tickets ASAP! They sold out of the Saturday only wristbands in the last day or so, and the Empire Ball was already sold out weeks ago. I am sorry to miss the ball, but I did get tickets for Lady Elsie’s Fashion Gala (a formal fashion show followed by dancing and socializing) as well as a burlesque event so your favorite Steampunk Roving Reporter will be able to bring you plenty of shenanigans well into the evening during the convention, which runs Sept 12-14. I will be tweeting and posting all weekend, which is also the last weekend of Steam Tour. 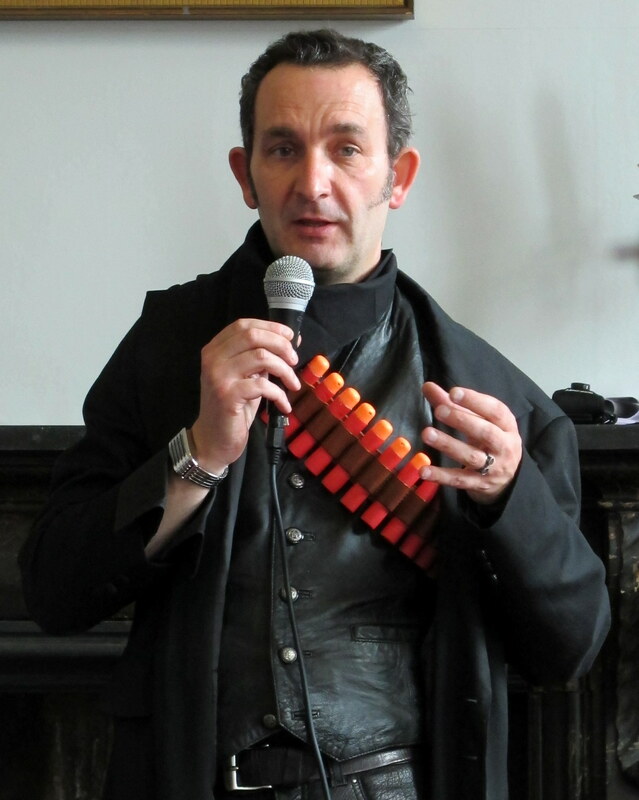 The website for the event run by the Victorian Steampunk Society is woefully short of details, but you can get event descriptions and buy tickets here. Going to be at convention and want to meet, and maybe even pick up youth very own airship bumper sticker? Leave me a comment and we’ll be in touch! Bumper Sticker to go with my Steampunk Zine! There is youtube video of a live performance, but the song quality is better if you use the link below to go to another site and hear the album version. Listen to this song for free here! Why don’t they love me? Once I figured out out how to do a hot air balloon I knew I couldn’t stop there! Here is my first (though definitely not my last) attempt at a 3D dirigible/airship. 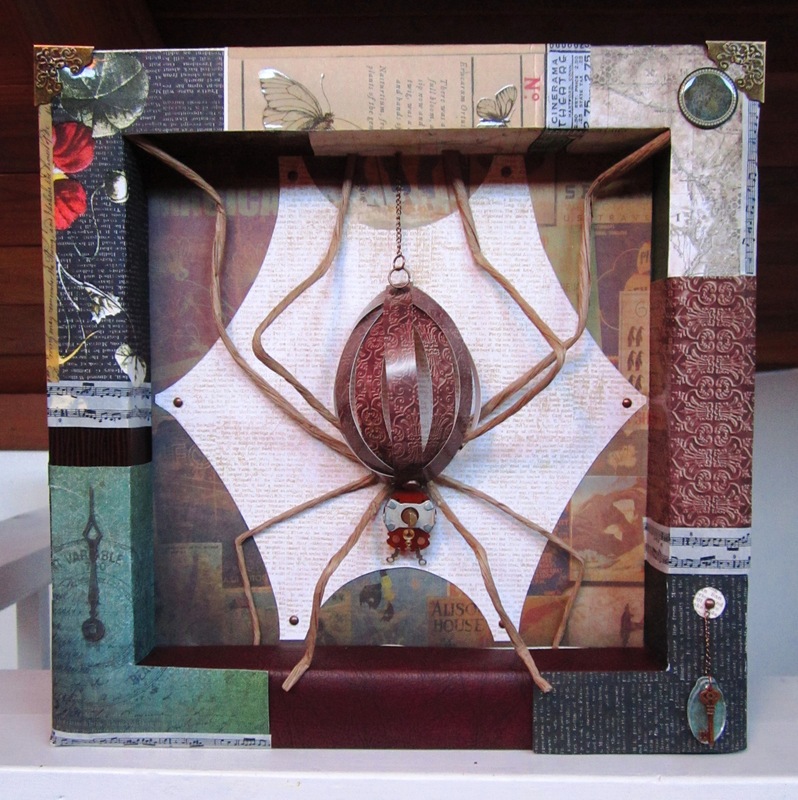 This shadowbox measures 12” x 12” and the back is finished so it can hang on the wall or stand alone on a shelf. I used a combination of glossy and matte papers, but the shiny parts aren’t nearly as shiny in person as they look on the photos. I have a light source directly above my photo area that can give a false impression with its glare. Each 12 x 12 shadow box takes approximately 10 hours to complete. They start their lives as canvases and are covered by cardstock and paper, then embellished with mixed media accoutrements. I made the dirigible and the boat using a similar method to my Christmas ornaments. Check out the tutorial here.